I think today of Steel Panther. If you’ve not yet had the pleasure, Steel Panther is a rock band cut from the cloth of every hair metal band from the 80s. They wear garish tights, boast towering monuments of styled hair, and literally shimmer with glitter in the stage lights. They can hit every note of every hair metal song you’ve ever heard. They are also a complete joke. 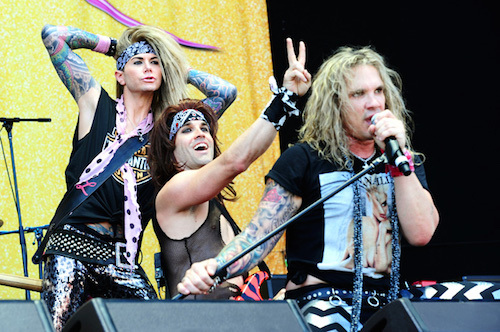 Steel Panther is a parody band, one that has taken the best and worst of every 80s metal stereotype and put it together on one stage. The band is profane, awash with misogyny, and an amalgam of everything that was ever good or terrible about the 80s rock scene. The band has been alive for 15 years operating under several different names, and its fan base is larger than you might think. Well, to understand it, you can look to America’s most recent embarrassment. As of today, real estate mogul Donald Trump is leading the polls for the Republican Presidential ticket by a wide margin. He’s leading all the political news coverage. He’s leading Google searches. He has upended the system for a few weeks, and he’s done it by using the Steel Panther System. It’s easier than you might think. When Trump stands in front of the cameras and riffs on John McCain being a prisoner of war, it blows our hair back a little. When he reads Lindsey Graham’s phone number on live television, we can’t help but laugh at how ridiculous it is. Yet, everyone keeps watching. Well, I think it has something to do with Steel Panther. See, Steel Panther plays all the hits, but it also has a large catalog of original songs. I spent a little while going through the original lyrics last night, and, because my mom reads everything here, I can’t post a single relevant stanza. That’s how extreme and profane the songs are. And yet, I’ve seen crowds of every creed and gender cheer with abandon. When a jaw-droppingly profane song about strippers and blow is sandwiched in between “Paradise City” and “Girls, Girls, Girls” it almost doesn’t sound extreme anymore. That is, when you’re clapping all the way up to the line, sometimes it’s easier to get dragged still clapping to the other side. All of this, of course, is unintentionally insulting. I owe an apology. I apologize to Steel Panther for associating you in any way with Donald Trump. It’s not your fault. That blame lies elsewhere. It was as if there had been a meeting of the American political establishment at which the only resolution was to undermine Donald Trump. And you know what? In a way, there was. Any time you hear a chorus of Republicans and Democrats saying the same thing, you can rest assured of one thing: they feel collectively threatened. Put another way, they all realized at once: uh-oh, we have gone too far. The thing no one is saying but is undeniably true is this: the reason Donald Trump exists is that the establishment–the Republicans, the Democrats, the pundits, the radio hosts, the listeners, and the party line voters–paved his way to stardom. Trump may be using the Steel Panther System to rally his crowds and keep himself on television, but he couldn’t have done it without having the right notes to play. Steel Panther wouldn’t exist but for the outlandishness of Mötley Crüe, Ratt, and Guns & Roses. Donald Trump wouldn’t exist but for…well, everything that’s happened in American politics since 1992. Trump is playing out of a songbook written by Rush Limbaugh and Glenn Beck, the Gilbert and Sullivan of modern GOP rhetoric. They are tunes that every talk radio listener knows by heart. While most candidates are content—and smart—to just play the hits in Muzak form, Trump is bebopping and scatting all over the place. His candidacy is pure damned jazz. He is what happens when you put Limbaugh, P.T. Barnum, and Steel Panther’s Stix Zadinia into one man. And that is terrifying to the Muzak candidates and everyone who supports them. Listen, when every Sunday morning talk show has people denouncing you, you know you are doing something very right or very wrong. If you can get Obama, Clinton, Graham, and Bill Kristol all on the same page, you are a bebopping superpower. Don’t get me wrong, I can’t think of anything much more scary than having Donald Trump as President…except maybe Frankenstein’s monster. He was a scary cat. You remember him: the creature created from old parts, one that is ridiculed by society, one that eventually rises up and demands a life for itself and drives its creator to madness and ruin. Yeah, that’s terrifying, huh? Good thing it’s fiction. By and by, I suspect Trump will go back in his hole. If there is one thing I’ve learned about American politics it’s that the theater only serves as a distraction long enough for the theater owners to tally the receipts. After all, the song may be right. Photo courtesy: Stuart Sevastos via Creative Commons. Stevey Wonder could fly a plane better than Hillary could protect the interest of the American people.